WHICH HOSPITALS ARE ALREADY WORKING TOWARDS SUSTAINABLE HEALTHCARE? The University of California’s Living Green program, is just one example of the progress towards sustainability in the healthcare sector. 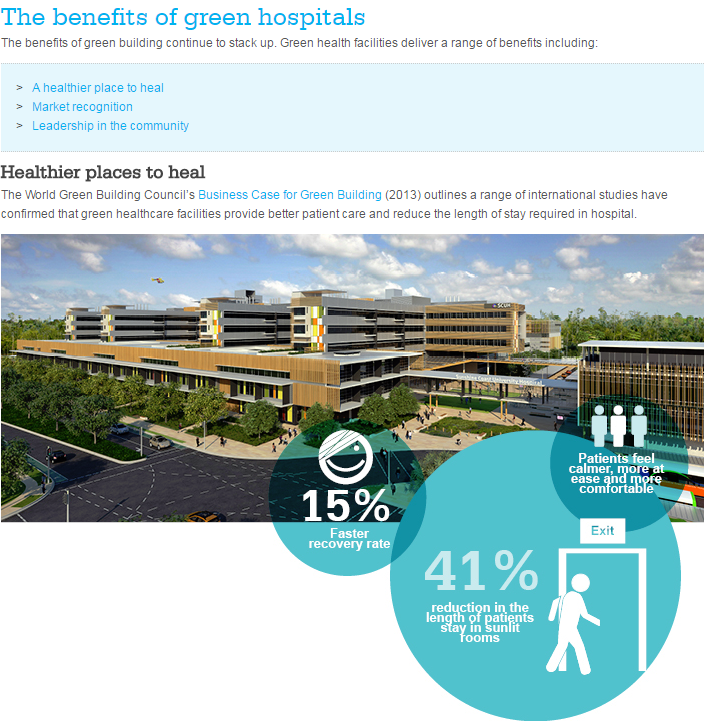 In the UK, Barts Health NHS Trust is another great example of how greening the health care sector can happen. 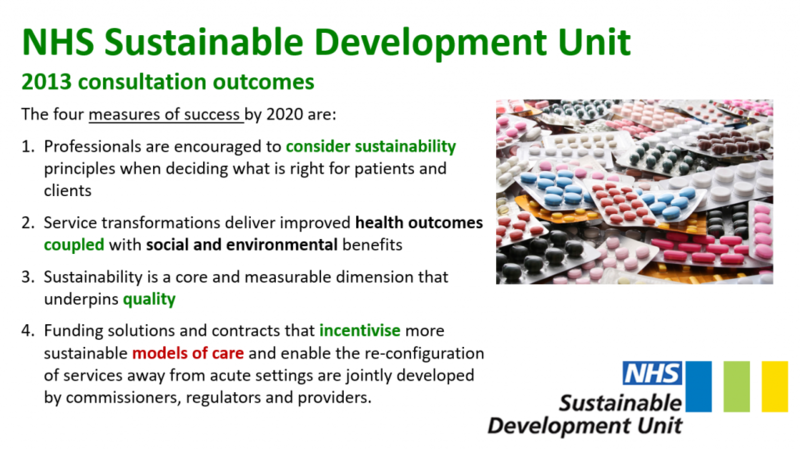 The NHS has it’s own Sustainable Development Unit which has been an outstanding leader in sustainable health care for decades. In this video, Washington Hospital presents much more detail on how sustainability can be achievable in healthcare (30 mins). Despite progress towards sustainable healthcare, we could do much more. Here is a highly research-focused UK model for healthcare (at least for the public system). Environmental harm is known to impact on public health (Eckelman & Sherman, 2016). Climate change is one of the most pressing of these concerns. 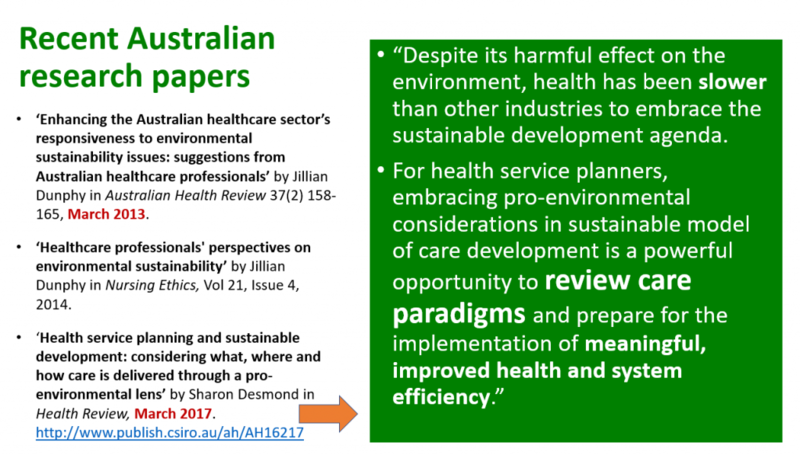 These (and more) compelling reasons for healthcare to act on environmental harm, are summarised in a Position Statement by the Royal Australian College of Physicians (Nov 2016). The Lancet journal has long taken a leadership role. Now The Lancet Countdown: Tracking Progress on Health and Climate Change is an international, multi-disciplinary research collaboration between academic institutions following on from the 2015 Lancet Commission on Health and Climate Change, which emphasised that the response to climate change could be “the greatest global health opportunity of the 21st century”. Check out the Lancet Countdown to track our progress on health and climate change here and below. Despite the spectre of climate change, there are considerable opportunities for sustainable healthcare, particularly in cost-saving with eco-efficiency measures. 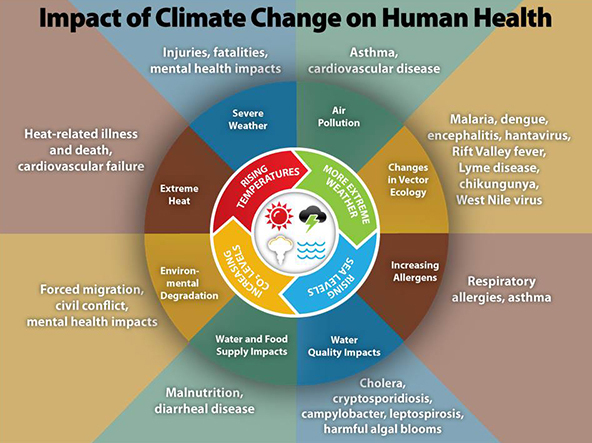 There are are also health co-benefits associated with sustainable development and climate change action, as well as many negative health impacts of inaction (including climate impacts like heatwaves, fires, floods and mosquito-borne diseases). Healthcare delivery emits high levels of emissions – in some cases, up to 25% of total public sector greenhouse gas emissions (UK, National Health Service, 2009, p. 74). 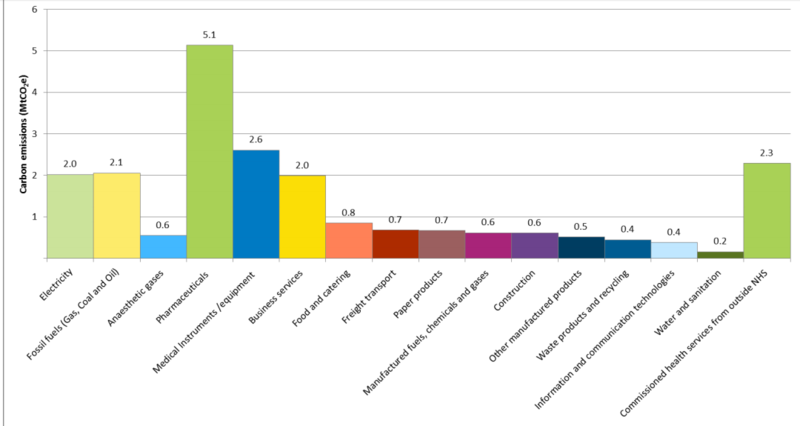 Australian hospitals consume 14% of energy consumed by all commercial building types (pitt&sherry in DCCEE, 2012, p. 5). Environmental impacts associated with healthcare delivery contribute to disease, given that approximately one quarter of all diseases caused by modifiable environmental causes (World Health Organization). 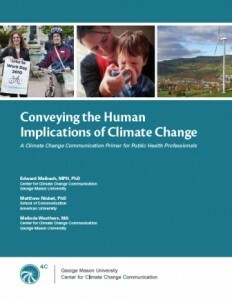 Climate change presents a very concerning set of risks to human health, as detailed in The Critical Decade: Climate change and health (Climate Commission, Australia, 2011). As above, some of the direct and indirect impacts of climate change on human health are associated with heat waves, rising sea-levels, drought and so on. Ironically, action on climate presents opportunities to improve health. This video from the Global Climate and Health Alliance talks about both the risks to human health and co-benefits if we act fast. Another quality short video explaining the top health impacts of climate is from NRDC (The Natural Resources Defense Council) (published 2017). Aside from climate change issues, the healthcare sector is contributing to other environmental harms including toxic waste and other pollution. Gary Cohen echoes these concerns in this short extract from a 2015 Tedx talk. Patients are becoming more aware of the need for healthier healing environments and corporate responsibility in health care with regard to sustainability. Some outstanding resources are now available from many different organisations to support and promote sustainable healthcare. For example, Climate for Health have put together an outstanding suite of free resources. 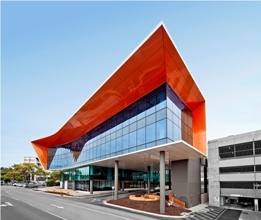 Other organisations playing a key role are the Global Green and Health Hospitals, Practice Greenhealth, the UK’s National Health Service and Sustainable Development Unit, as well as Australia’s own Climate and Health Alliance, boasting diverse membership from Australia’s peak medical and health organisations. For every tonne of carbon dioxide avoided, countries could save an average of $46 in health costs (refer also Our Uncashed Dividend: the Health Benefits of Climate Action, 2012). The Global Green and Health Hospitals (GGHH) network has been formed to bring together health organisations that are committed to reducing their environmental impact and promoting environmental health worldwide. GGHH is a virtual community for hospitals, health systems and organisations around the world — currently across 53 countries. Most healthcare sustainability challenges are common despite different cultural contexts – so if you have a problem, someone in the network has probably already solved that problem and is willing to share how. A global group of experts are also on hand to provide advice and resources. GGHH focuses on a comprehensive environmental health agenda featuring 10 action areas associated with: waste, energy, harmful chemicals, buying safer and more sustainable products, water, transport, food, pharmaceuticals, buildings and leadership. The ‘Agenda’ is available for downloading in four languages. In GGHH, each organisation that joins goes about focusing on two goals which may often deliver financial benefits in tandem. To help this process, GGHH is publishing a series of webinars on different topics such as waste, sustainable buildings and sustainable energy for healthcare centres. 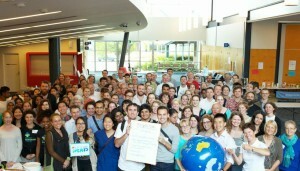 The NHS Sustainable Development Unit (SDU) in the UK has long been another important leader in sustainable healthcare. The SDU is a proponent of ‘sustainable models of care’ which goes to the heart of healthcare’s core function. The NHS SDU propose that success might include the following. Examples of how this might be implemented can be found in the ‘Operation TLC’ program rolled out across a number of NHS trusts. In Australia, the GGHH network is supported by the Climate and Health Alliance (CAHA), comprising members from many healthcare peak bodies. CAHA has published many important publications on greening the sector and in 2017, a Framework for a National Strategy on Climate, Health and Well-being for Australia was launched at Parliament House in Canberra. CAHA’s GGHH network is growing, with hundreds of health services involved from Australia and New Zealand. Globally the GGHH network reaches around 9000 hospitals (2015). The network will drive sustainable healthcare, transform the sector, and encourage the sector to contribute to, rather than harm, public health. The network will also influence supply chains so that healthcare providers can more easily access environmentally-friendly alternative products. For more information visit the Global Green and Healthy Hospitals Network and the Climate and Health Alliance in Australia. Australian researchers are also making a contribution in this area. There are many ways to address the environmental harms created by the health sector. For example, greenhouse gas emissions may come from energy consumption, staff/patient transport and procurement, including pharmaceuticals and single-use devices (NHS 2010). 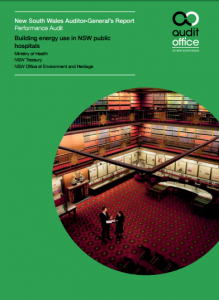 One of the most comprehensive assessment of energy use in hospitals can be found in this 2013 report (pictured at right) and available here. The following collection of diagrams provide a broad brush impression of where opportunities may lie for improving financial and environmental performance. Some of the data may surprise you! 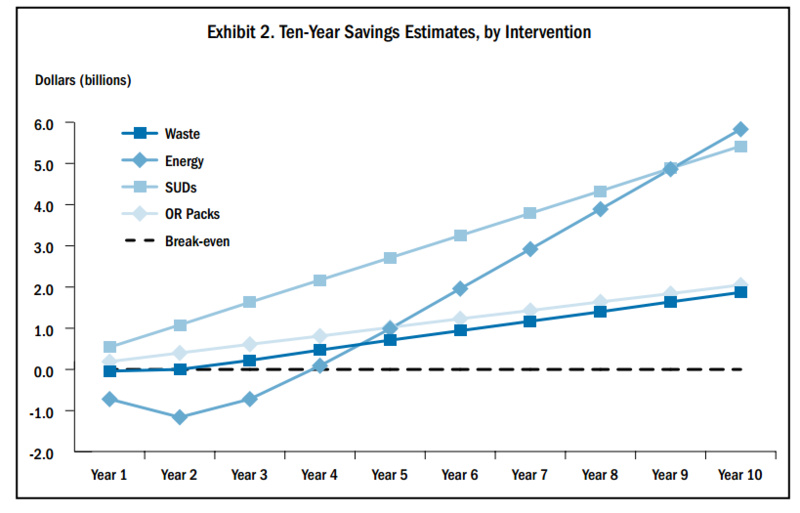 For example, the following projected savings by intervention is extracted from a study of exemplar hospitals – Can Sustainable Hospitals Help Bend the Health Care Cost Curve? by Kaplan et al 2012. You will note that impressive savings were made by reprocessing single-use-devices and reformulating operating room equipment packs. 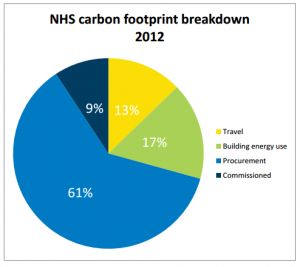 The UK’s National Health Service (NHS) has made a concerted effort over a long period of time to address its carbon footprint – refer to the next few diagrams. The latest report was published in January 2016 and is based on 2015 data. 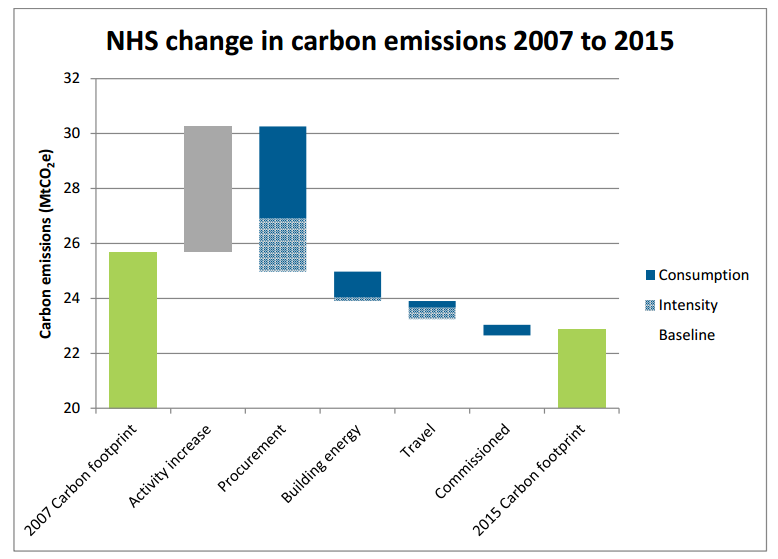 It shows that the NHS carbon footprint in England is 22.8 million tonnes of carbon dioxide equivalents (MtCO2e). Between 2007 and 2015 the carbon footprint has reduced by 11%. Europe’s Green@Hospital pilot (2014) found that hospitals could save around 15% of energy consumed through a range of strategies outlined in this 6 minute video. 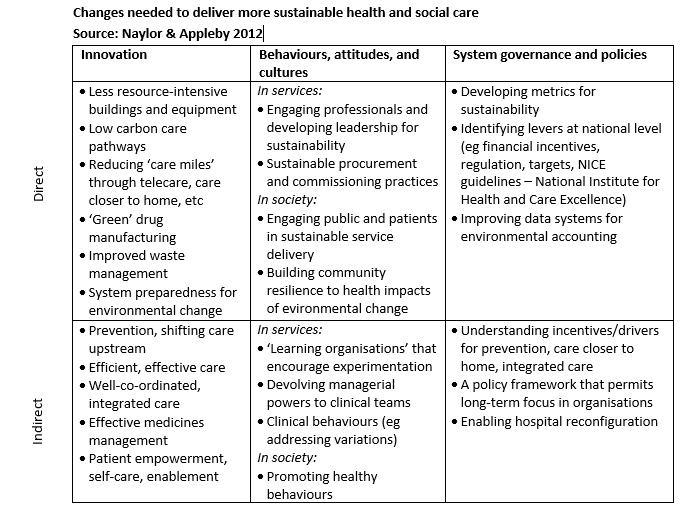 The following table is taken from Sustainable Health and Social Care: connecting environmental and financial performance is based on a literature review and stakeholder consultation carried out by The King’s Fund on behalf of the National Institute for Health Research and the Social Care Institute for Excellence. 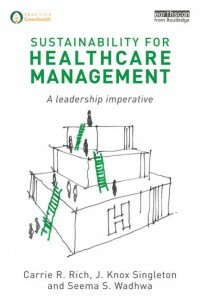 The authors consider how health and social care needs to change to become more environmentally sustainable. A key finding is that improving efficiency at the operational level is unlikely to be sufficient. A more fundamental transformation in service models will be needed, with a greater emphasis on prevention, shifting care upstream, better integration and co-ordination of care, and an ongoing focus on maximising value for patients. The following outlines some specific practical strategies although each facility should evaluate each on their own merit in their own context. 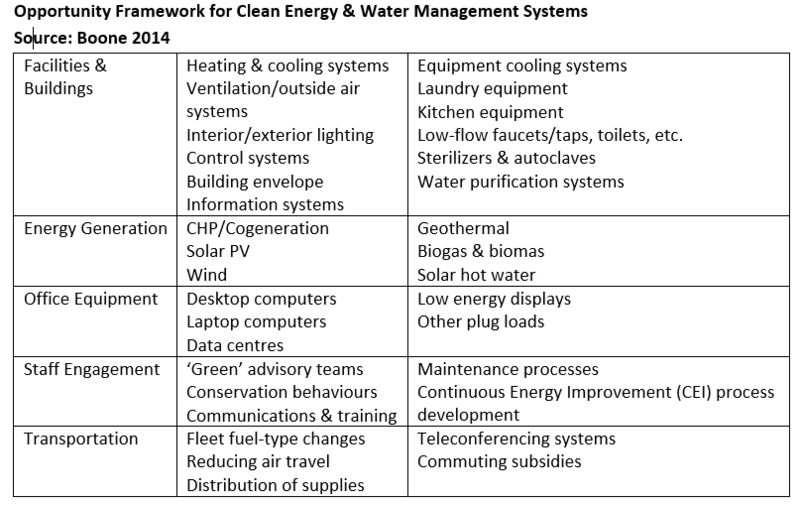 The table is extracted from ‘Health Care & Climate Change: an opportunity for transformative leadership‘ by Boone (2014), published by Health Care Without Harm. Learn more from hospitals who have saved money (eg with a 2-5 year payback period) by becoming more energy efficiency, using energy management systems, and engaging staff. The global Healthy Energy Initiative is mobilizing the health sector to play a central role advocating for a move away from fossil fuel-based power generation—particularly coal—and toward clean, renewable healthy energy options. The initiative is led by Health Care Without Harm and is comprised of a network of partners made up of health professionals, health organizations, and academic research institutions, from around the world. 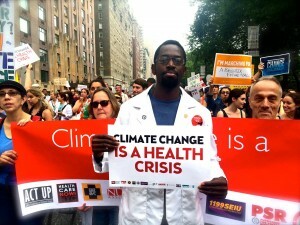 The approach includes supporting top-notch research on the health impacts of energy choices, developing educational materials for health professionals and the general public, promoting health sector divestment from coal, and advocating for energy policies a the local, national and global level that promote public health. 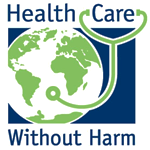 Health Care Without Harm (HCWH) provides global coordination for the Healthy Energy Initiative. For more information see www.noharm.org Read CAHA’s own Joint Position Paper and Background Paper on healthy energy choices here. Read about energy benchmarking in Canadian hospitals here, Australia here (Fifth Estate, 2013), Victoria here, and by Practice Greenhealth in the USA (members login required). 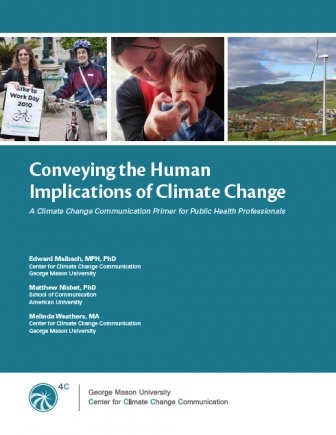 ‘Let’s Talk Health and Climate: Communication Guidance for Health Professionals’ combines values research, communications, and specific messaging into a single resource, so you can learn how to create messaging that truly resonates with the health and healthcare audience. Conveying the Human Implications of Climate Change (Maibach et al, 2011), George Mason University Centre for Climate Change Communication can be found here. Other parts of the Getting to Sustainability website convey information about communication, pro-environmental behaviours and climate change. 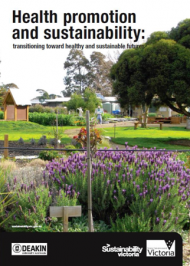 Victorian Government – sustainability in healthcare. 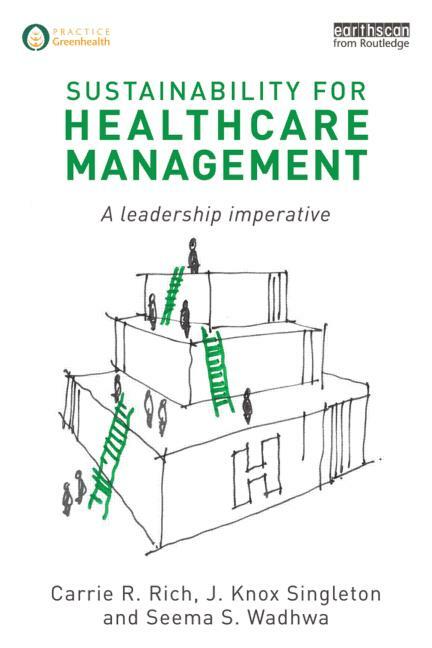 Sustainability for Healthcare Management – a leadership imperative (2013) – a practical guide with sample data, illustrations and sample conversations throughout to help frame and integrate concepts. Carbon Trust UK has an easy to read hospital resource here. Are Australia’s future doctors being educated about climate change and health? 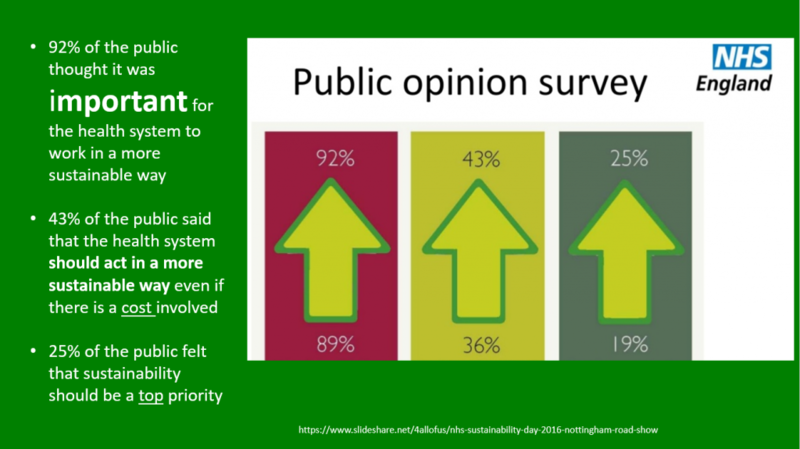 What are nurses and midwives doing to green healthcare? What would a National Strategy for Climate and Health in Australia look like? NB – Other relevant sections of this website include our page on procurement.